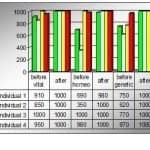 Our goal was to explore possible changes in mental/spiritual and physical level in individuals who were exposed in Hemi-Sync® audio experience. 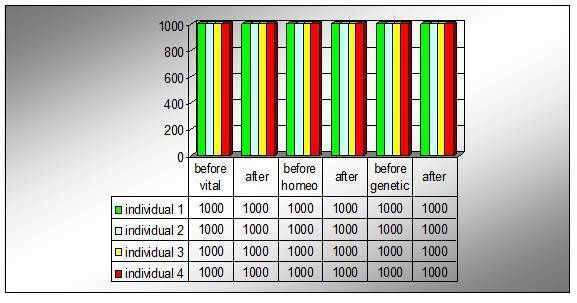 According to the diagram we see that after the application of Hemi-Sync® the level of consciousness increased from 50 to 300 points. 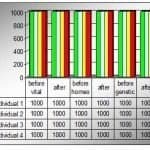 In this calibration we used two samples. 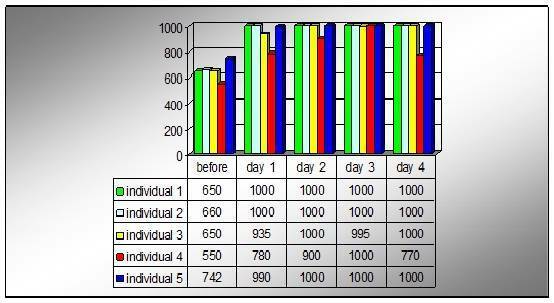 In the first sample we used 5 people and calibrated the same people every day. 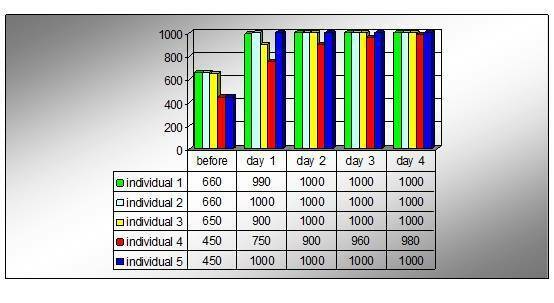 In the second sample we calibrated 4 different people every day. 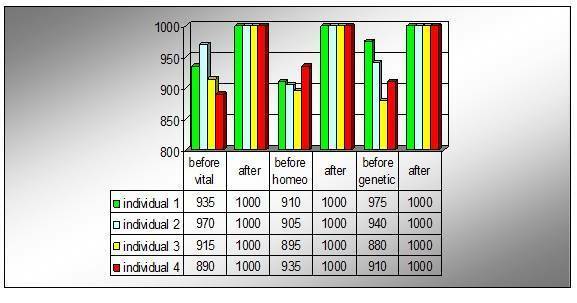 In the table we observe that the level of the vital energy of 5 people was quite low before the start of the seminar and during and after the end 4 of the 5 people were increasing in 1000 except for one that was slightly less rise in relation to the other .It is important to mention that this person is suffering from rheumatoid arthritis. 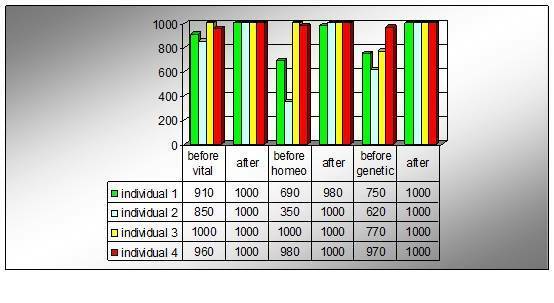 In the table we observe that 4 out of 5 people had reach perfection except the one who suffered rheumatoid arthritis but as we can notice the level of her homeostasis increased significantly. 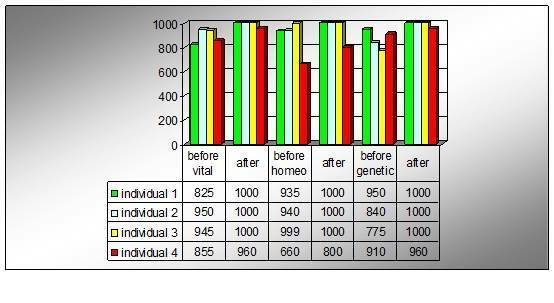 In the table we observe that again 4 out of 5 people reached perfection except the one with rheumatoid arthritis. 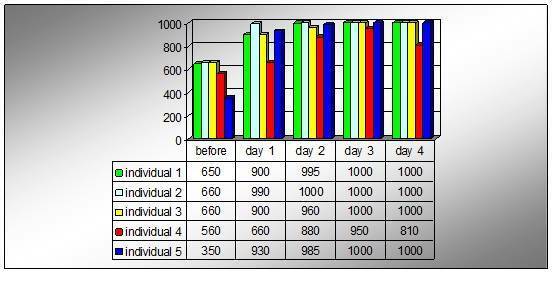 We can also notice that individual 5 had a considerable increase from 350 to 930 only after one day of applying Hemi-Sync®. 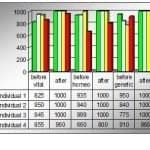 In the above tables we observe that all the individual reached perfection except individual 4 that suffers from psoriasis, in day 2. 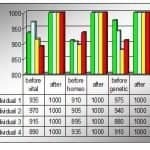 According to the above results we come to the conclusion that the application of Hemi-Sync® can bring about considerable changes and can have a very positive impact on many levels in the human being.